Oberstdorf (Low Alemannic: Oberschdorf) is a municipality and skiing and hiking town in southwest Germany, located in the Allgäu region of the Bavarian Alps. Oberstdorf is one of the highest market towns in Germany. The southernmost point in Germany is located in the municipality and it is the southernmost settlement in both Bavaria, and in Germany overall. At the center of Oberstdorf is a church whose tall spire serves as a landmark for navigating around town. The summits of the Nebelhorn and Fellhorn provide dramatic panoramic views of the alps. The Nebelhorn can be reached with a big cable car. Visitors can ride a unique diagonal elevator to the top of the Heini-Klopfer-Skiflugschanze. Kornau , 915 m. In the vicinity is the Söllereckbahn and the Chapel of St. Fabian and St. Sebastian which is rich in art treasures. In Reichenbach (population: 226) is the 450-year-old Chapel of St. James and the Moorwasser swimming pool. The little hamlet of Rubi has 175 inhabitants. Typical of Schöllang are the farm houses around the Baroque onion tower of the parish church. In the vicinity is the 1531 castle church. The village of Tiefenbach takes its name from trees called Bergkiefer. The village lies on a terrace above the Breitach stream. Tiefenbach has a centuries-old spa tradition thanks to its sulphur spring. As early as the late 15th century counts and other high-ranking people convalesced here to cure their illnesses. Oytal and Dietersbachtal are separated by the Höfats and Rauheck. Gerstruben, Germany's highest village, lies at the entrance to the Dietersbachtal. 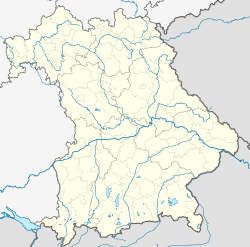 The Rappenalptal is the longest and runs from Germany's southernmost village, Einödsbach, past the Haldenwanger Eck, Germany's southernmost point. At the end of the valley the Schrofen Pass leads to Austria. Findings show that the Oberstdorf area was already inhabited from the Stone Age to the Roman Empire. When the Romans had abandoned the area east of the Upper Rhine and north of the Upper Rhine in the 3rd century, various Germanic groups migrated into the area, which were later called Alemanni. Oberstdorf was first mentioned in 1141. King Maximilian, the later emperor, granted Oberstdorf in 1495 the right to hold a market and the High Court. In 1518 Count Hugo of Montfort built a spa in Tiefenbach at the sulphur spring, which is regarded as a precursor of today's spa facility. In December, before every New Year, Oberstdorf hosts the first part of the ski jumping Four Hills Tournament on the Schattenberg large hill. There is also a ski flying hill, Heini-Klopfer-Skiflugschanze, about seven kilometres to the south. ABC's Wide World of Sports famously featured the Oberstdorf ski flying hill when Vinko Bogataj fell during his jump in 1970, thus becoming known as "The Agony of Defeat". Oberstdorf hosted the Nordic skiing World Championships in 1987 and 2005 and won the bid for the 2021 World Championships. The town has also hosted several stages of the Tour de Ski, a cross-country skiing stage event. Germany's modern figure skating center was built on the outside of the town. It has three covered rinks and some of them are accessible to the public, for recreational skating. It is a popular destination with European skaters for training camps. Oberstdorf hosts the annual Nebelhorn Trophy figure skating competition and has hosted the German Figure Skating Championships twelve times. It has also hosted the 1982, 2000, and 2007 World Junior Figure Skating Championships. One of the two ISU adult figure skating competitions (for skaters aged 28 and older) is held in Oberstdorf each May. Mountain bikers start their Transalp tour in Oberstdorf on the Schrofen Pass to Riva del Garda. Andreas Heckmair, who participated in the first ascent of the North Face of the Eiger in 1938 lived in Oberstdorf until his death in 2005. ^ Kompass walking, cycling and ski touring map: Sheet 03 Oberstdorf, Kleinwalsertal (1:25,000). ISBN 978-3-8549-1231-6 (as at: 2009). ^ Flade, Tatjana (July 22, 2011). "Carolina Kostner Attends Camp In Oberstdorf, Germany". IFS Magazine. Archived from the original on September 10, 2011. Retrieved July 28, 2011. ^ "Adult Skating - International Skating Union". www.isu.org. Retrieved 2019-02-17. Wikimedia Commons has media related to Oberstdorf. This page was last edited on 17 March 2019, at 03:46 (UTC).